Robomow® RL2000 is an automatic lawnmower that cuts the grass all by itself. All you have to do is schedule a weekly program. It will depart from the Base Station at the pre-set scheduled days and times. At the end of each operation Robomow® returns to the Base Station for charging until the next scheduled operation. Your lawn will be maintained even when you are away from home! 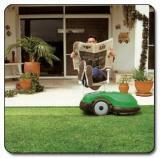 Designed for lawns measuring from 12,900 to 17,200 square feet. Much less pollution than gas mowers. Automatic, set it and it does the job week after week. Can pay for itself in one year.